Of course, once I had gotten finished squealing I forwarded it to several people, showed it to coworkers and uttered the phrase "I want it" about 30 zillion times. I guess the other recipients had the same inclination because Ryan's friend, Lanier, loved it so much she posted it to Reddit. Lest we learned nothing from the White and Gold or Blue and Black debacle of '15, an innocuous Reddit post can get outta hand...QUICK! 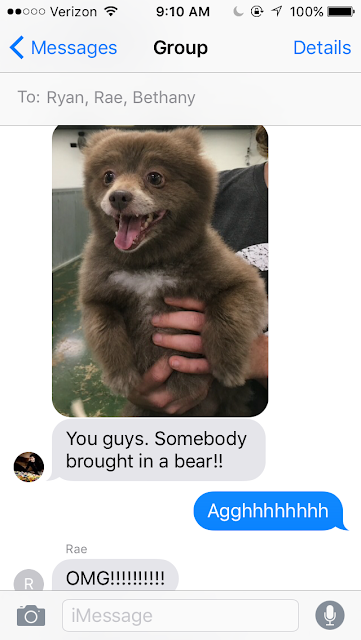 On Wednesday the 29th, Lanier texted Ryan saying that little reddit post about a bear dog had 5000 up votes. And she saw it on Unilad’s Facebook (Lanier’s reddit handle got credit) where it had been shared over 5000 times and had over 86,000 likes. (now over 17,000 shares and over 200,000 likes). Also it had pretty much broken Tumblr with reblogs [Tangent: I think that's the terminology. I have no idea how Tumblr works. One platform at a time, guys!] DEAR GOD. Cut to a week later every media outlet that believes in journalistic integrity has taken the story of the Bear Dog and made it front page news. [Tangent: Once again Ryan is going viral: F*#kable Milhouse strikes again.] 9gag posted it on their Instagram on the 3rd, and it has over 833,000 likes. 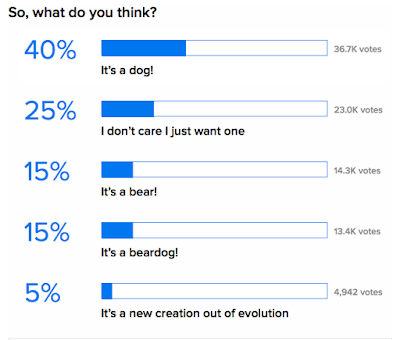 To further prove the ridiculous proportions reached, over 92,000 actual humans have participated in a Buzzfeed survey to find out whether it is a bear or dog. Once Ryan was somehow connected to the story about Bounce, he was being tweeted at by MTV news, E! online as well as news affiliates all over the country. They had 120 questions about the mystery bog. [Tangent: In the words of OMC, "How Bizarre!"] You can click here to read his expose with a Philly ABC station which I can only assumed is called "Slow News Day, Philadelphia." I'm only upset I didn't think to pitch this to Hello Giggles [Tangent: who of course covered it here.] when it was still flying under the radar....I guess I underestimated how hard it would be to figure out it was a dog (and not a bear) at a doggie day care. Next time I won't assume it to be such was a cut and dry issue! 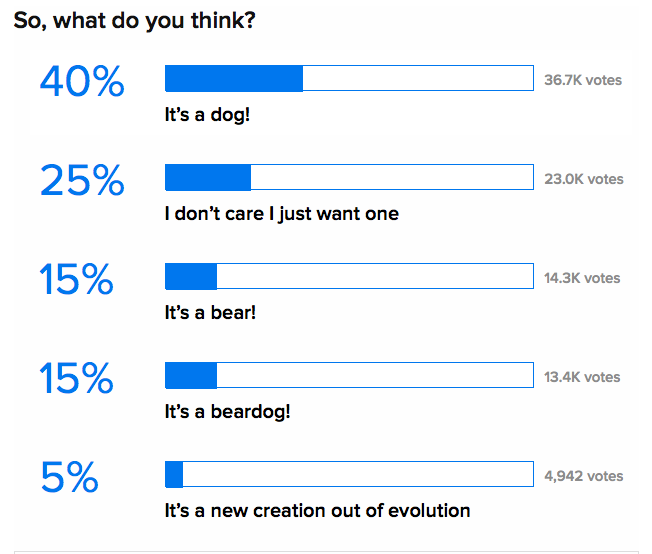 The funny thing is that this is not the first time the internet has lost its damn mind over a mystical dog bear. There was another incident that hit buzzfeed hard last January. You can read about it here. Spoiler alert: Its a dog!